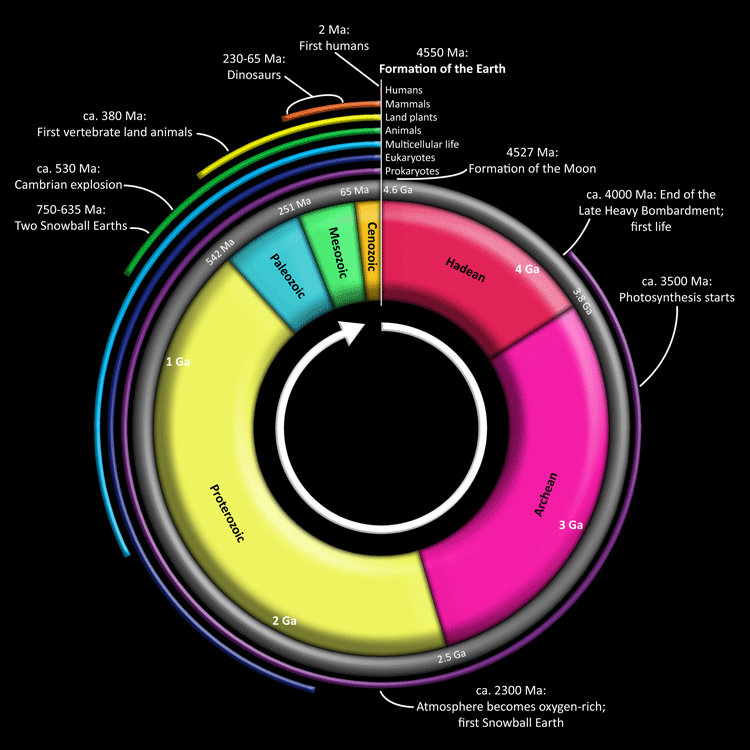 This clock representation shows some of the major units of geological time and definitive events of Earth history. The Hadean eon represents the time before fossil record of life on Earth; its upper boundary is now regarded as 4.0 Ga . Other subdivisions reflect the evolution of life; the Archean and Proterozoic are both eons, the Palaeozoic, Mesozoic and Cenozoic are eras of the Phanerozoic eon. The two million year Quaternary period, the time of recognizable humans, is too small to be visible at this scale. Geologists qualify these units as Upper, Middle, and Lower. Examples are "Upper Jurassic" and "Middle Cambrian". The adjectives are capitalized when the subdivision is formally recognized, and lower case when not; thus "early Miocene" but "Early Jurassic." The names of subdivisions can vary when discussing either position in the geologic record or corresponding time period, by use of either upper/lower (for series) or late/early (for epochs). For example, the Lower Jurassic Series in geochronology corresponds to the Early Jurassic Epoch in chronostratigraphy. Animation showing Earth's palaeogeographic reconstruction beginning from early Cambrian period. In classical antiquity, Aristotle saw that fossil seashells from rocks were similar to those found on the beach and deduced that the fossils were once part of living animals. He reasoned that the positions of land and sea had changed over long periods of time. Leonardo da Vinci concurred with Aristotle's view that fossils were the remains of ancient life. It is also possible that the sea may have happened to flow little by little over the land consisting of both plain and mountain, and then have ebbed away from it. ... It is possible that each time the land was exposed by the ebbing of the sea a layer was left, since we see that some mountains appear to have been piled up layer by layer, and it is therefore likely that the clay from which they were formed was itself at one time arranged in layers. One layer was formed first, then at a different period, more layer`s was formed and piled, upon the first, and so on. Over each layer there spread a substance of different material, which formed a partition between it and the next layer; but when petrification took place something occurred to the partition which caused it to break up and disintegrate from between the layers (possibly referring to unconformity). ... As to the beginning of the sea, its clay is either sedimentary or primeval, the latter not being sedimentary. It is probable that the sedimentary clay was formed by the disintegration of the strata of mountains. Such is the formation of mountains. His contemporary, Abu Rayhan Biruni (973-1048), discovered the existence of shells and fossils in regions that once were seas and later became dry land, such as the Indian subcontinent. Based on this evidence, he realized that the Earth is constantly evolving and proposed that the Earth had an age, but that its origin was too distant to measure. Later in the 11th century, the Chinese naturalist, Shen Kuo (1031–1095), also recognized the concept of 'deep time'. 3. The strata of any given area represented only part of the Earth's long history. The first serious attempts to formulate a geological time scale that could be applied anywhere on Earth were made in the late 18th century. The most influential of those early attempts (championed by Abraham Werner, among others) divided the rocks of the Earth's crust into four types: Primary, Secondary, Tertiary, and Quaternary. Each type of rock, according to the theory, formed during a specific period in Earth history. It was thus possible to speak of a "Tertiary Period" as well as of "Tertiary Rocks." Indeed, "Tertiary" (now Paleocene-Pliocene) and "Quaternary" (now Pleistocene-Holocene) remained in use as names of geological periods well into the 20th century. The process was dominated by British geologists, and the names of the periods reflect that dominance. The "Cambrian," (the Roman name for Wales) and the "Ordovician," and "Silurian", named after ancient Welsh tribes, were periods defined using stratigraphic sequences from Wales. The "Devonian" was named for the English county of Devon, and the name "Carboniferous" was simply an adaptation of "the Coal Measures," the old British geologists' term for the same set of strata. The "Permian" was named after Perm, Russia, because it was defined using strata in that region by Scottish geologist Roderick Murchison. However, some periods were defined by geologists from other countries. The "Triassic" was named in 1834 by a German geologist Friedrich Von Alberti from the three distinct layers (Latin trias meaning triad) —red beds, capped by chalk, followed by black shales— that are found throughout Germany and Northwest Europe, called the 'Trias'. The "Jurassic" was named by a French geologist Alexandre Brogniart for the extensive marine limestone exposures of the Jura Mountains. The "Cretaceous" (from Latin creta meaning 'chalk') as a separate period was first defined by Belgian geologist Jean d'Omalius d'Halloy in 1822, using strata in the Paris basin and named for the extensive beds of chalk (calcium carbonate deposited by the shells of marine invertebrates). The first geologic time scale was eventually published in 1913 by the British geologist Arthur Holmes. He greatly furthered the newly created discipline of geochronology and published the world renowned book The Age of the Earth in 1913 in which he estimated the Earth's age to be at least 1.6 billion years. 1. ^ International Commission on Stratigraphy 2008:http://www.stratigraphy.org/column.php?id=Chart/Time%20Scale, retrieved 9 March 2009. 2. ^ International Commission on Stratigraphy. "International Stratigraphic Chart". http://www.stratigraphy.org/upload/ISChart2009.pdf. Retrieved 2009-09-25. 6. ^ Rudwick, M. J. S. (1985). The Meaning of Fossils: Episodes in the History of Palaeontology. University of Chicago Press. p. 24. ISBN 0226731030. 7. ^ Sivin, Nathan (1995). Science in Ancient China: Researches and Reflections. Brookfield, Vermont: Ashgate Publishing Variorum series. III, 23–24. 8. ^ John McPhee, Basin and Range, New York:Farrar, Straus and Giroux, 1981, pp.95-100. 9. ^ John McPhee, Basin and Range, pp.113-114. 10. ^ (in Russian) Great Soviet Encyclopedia (3rd ed.). Moscow: Sovetskaya Enciklopediya. 1974. vol. 16, p. 50. 15. ^ International Commission on Stratigraphy. "International Stratigraphic Chart". http://www.stratigraphy.org/upload/ISChart2009.pdf. Retrieved 2009-09-25. 16. ^ Paleontologists often refer to faunal stages rather than geologic (geological) periods. The stage nomenclature is quite complex. For an excellent time-ordered list of faunal stages, see "The Paleobiology Database". http://flatpebble.nceas.ucsb.edu/cgi-bin/bridge.pl?action=startScale. Retrieved 2006-03-19. 17. ^ a b Dates are slightly uncertain with differences of a few percent between various sources being common. This is largely due to uncertainties in radiometric dating and the problem that deposits suitable for radiometric dating seldom occur exactly at the places in the geologic column where they would be most useful. The dates and errors quoted above are according to the International Commission on Stratigraphy 2004 time scale. Dates labeled with a * indicate boundaries where a Global Boundary Stratotype Section and Point has been internationally agreed upon: see List of Global Boundary Stratotype Sections and Points for a complete list. 18. ^ a b Historically, the Cenozoic has been divided up into the Quaternary and Tertiary sub-eras, as well as the Neogene and Paleogene periods. The 2009 version of the ICS time chart recognizes a slightly extended Quaternary as well as the Paleogene and a truncated Neogene, the Tertiary having been demoted to informal status. 20. ^ The start time for the Holocene epoch is here given as 11,430 years ago ± 130 years (that is, between 9610 BC-9560 BC and 9350 BC-9300 BC). For further discussion of the dating of this epoch, see Holocene. 21. ^ a b In North America, the Carboniferous is subdivided into Mississippian and Pennsylvanian Periods. 22. ^ The Precambrian is also known as Cryptozoic. 23. ^ a b c d e f g h i j k l m n The Proterozoic, Archean and Hadean are often collectively referred to as the Precambrian Time or sometimes, also the Cryptozoic. 24. ^ a b c d e f g h i j k l Defined by absolute age (Global Standard Stratigraphic Age). 26. ^ Though commonly used, the Hadean is not a formal eon and no lower bound for the Archean and Eoarchean have been agreed upon. The Hadean has also sometimes been called the Priscoan or the Azoic. Sometimes, the Hadean can be found to be subdivided according to the lunar geologic time scale. These eras include the Cryptic and Basin Groups (which are subdivisions of the pre-Nectarian era), Nectarian, and Early Imbrian units. 27. ^ a b c d These unit names were taken from the Lunar geologic timescale and refer to geologic events that did not occur on Earth. Their use for Earth geology is unofficial. 28. ^ Bowring, Samuel A.; Williams, Ian S. (1999). "Priscoan (4.00–4.03 Ga) orthogneisses from northwestern Canada". Contributions to Mineralogy and Petrology 134: 3. doi:10.1007/s004100050465. The oldest rock on earth is the Acasta Gneiss, and it dates to 4.03 Ga, located in the Northwest Territories of Canada.